"Dad, My turn now!" Dad takes such good care of his babies. The one in front of Dad being fed, flutters, flutters, and flutters, to make sure Dad sees him, so Dad doesn't forget that he's hungry too, Right Now! The other Grosbeak chick is being so patient. Waiting his turn with Dad. He too will flutter and carry on during his turn. Saying, "Here I am. It's my turn now. Don't forget me." Summertime on our deck is wonderful as each family brings their babies to our feeder. They are just learning to fly but still cannot feed themselves. We have the pleasure to see a new show each day. The 7/8" edge of this painting is painted as a Gallery Edge. It is painted to match the picture. It may be framed or hung on the wall as is. It may also be framed in a silhouette frame that will show off the Gallery edge painting. I like to paint the edges as part of the picture to give you a choice of how to hang it. When you are coming into a room or down a hall the effect is to give a color visual of something to see that is different or unexpected, rather than the regular edge of wood frame. 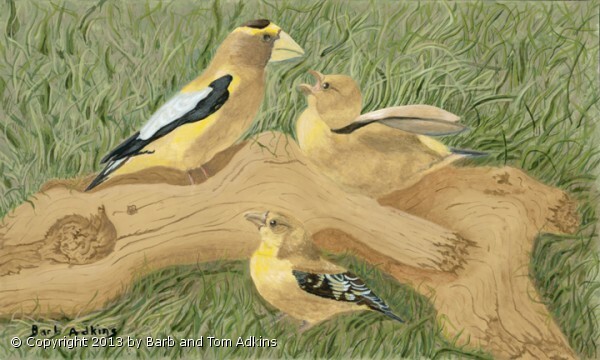 Dinner Time was accepted into the May Juried show of Bird of Evergreen, presented by the Evergreen Artists Assoc. Giclee Prints printed on high end archival paper or Canvas are available. Please call for sizes and pricing.